Ding and I were co-partners for 17 years, he passed over 4/09/05. I have been very blessed to walk beside him in this life time. We came together when he was 5 weeks old. At that time, I had no idea what I had taken on. “Living with a Dingo” is a commitment for life and a disciplined responsibility. He was very cheeky, wicked and extremely funny. Two Leo’s together, “what can I say”. We had our challenges. Living with a Dingo changed my life, on all levels, physically, mentally, emotionally, and spiritually. For me, he was my Lion King, my Child, Partner, Best Friend, Wise Teacher, Soul Mate, Security and Universal Guardian and still is. Ding appeared in the first “BABE” movie as an “Atmosphere Dog”. I was an Animal Trainer on the film. He also made his presence at a Hospice, by request, on many occasions. Wherever I was working, Ding was with me. 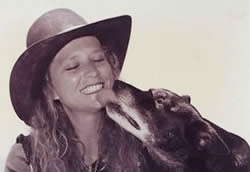 For the past 10 years we worked together, side by side, everyday educating people how to “connect and communicate” with their animals. He touched the hearts of everyone who had the pleasure of being in his energy field. His energy and presence rehabilitated unconscious patterns of behaviour in so many people, children and family’s. How lucky they are. Three films are in the making of, in honour of him. It is my life’s passion to produce educational Dingo films, and to play an active part in the united front for the complete protection and conservation of the Dingo. Ding’s passing ceremony was on a full moon rising and this is a poem that came out of that moment in time, that rest’s with him in peace.